BOSWORTH Independent College art teacher and professional, award-winning artist, Lee Burrows, recently featured in the Landscape Artist of the Year 2015 competition on Sky Arts. Joan Bakewell and Frank Skinner host the competition, and they teamed up with the National Trust to film in a number of the charity's famous UK properties and locations. Joan Bakewell said: "It's such a pleasure to meet gifted artists and watch how their work grows. Once again we will be on the lookout for outstanding talent: and I'm sure we'll find it." In total there are nine episodes and Lee featured in episode three, held at Waddesdon Manor in Buckinghamshire, where he had just four hours to paint the French Renaissance-style chateau. Lee said: "The Sky Arts team chose from thousands of applicants who applied online. I was asked to send two images of my paintings and from viewing these, the Sky Arts team invited me to attend. "My heat was held at Waddesdon Manor, an incredible Neo-Renaissance-style French chateau built in the late 19th Century by Baron Ferdinand de Rothschild, now bequeathed to the National Trust. I painted the left corner of the main building because as a wild card artist I was asked to set up in the same area but, I could choose my preferred view. "I enjoyed working alongside all the other artists, all so absorbed in what they were creating and the different variety of work produced. Painting en plein air is always difficult because of the changing light and weather conditions but I really enjoy the challenge. 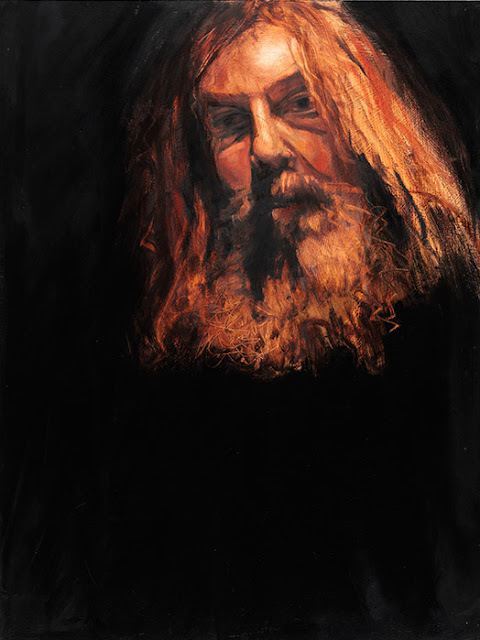 "The judges talked to me far more than was actually featured on the programme, they liked my approach to the subject and they were interested by my choice of Burnt Sienna ground. Burnt Sienna is the red colour with which I chose to cover my canvas, indeed, it was a technique often used by Constable. The producer really liked my painting and she explained that I was very close to being put through to the semi-finals. "I enjoyed the day very much and it was really good to paint a landscape I would perhaps never have thought to paint. I do feel my work was possibly too traditional and maybe not quite unusual enough for television, however art is a wide and varied subject and that is one reason why it is so fascinating. I really enjoy sharing the knowledge I have acquired over the years both in technique and art history. I try to stress to my students that art is so much more than producing images. The paintings and drawings they produce reflect thought, personality, individualism and emotion, they should speak in ways words cannot. "I try to encourage my students to always be artists, to always be looking and seeing, to think and to document their thoughts and ideas. Art covers so much of life and the human condition and because of this we tend to have wide and varied class discussions, I enjoy this immensely, especially because the students are from many different countries and cultures. Sharing our thoughts together as a group, makes my time spent at Bosworth fascinating." While Lee narrowly missed the semi-finals of the competition, he remains an extremely popular and accomplished artist, imparting his vast knowledge to Bosworth students. Excerpt from an interview conducted by D M Mitchell for Paraphilia Magazine. It can be downloaded from Issuu.com (here). Do you think art/literature etc still has a voice that can make any difference? Can it even be heard nowadays? Of course art and literature make a difference. Increasingly, in a world dominated by booming governmental and corporate pronouncements, individual human voices are about the only things that can make a difference. Just using it as an example that‘s readily to hand, for whatever reason movements like Occupy or Anonymous have adopted the V for Vendetta mask and basic ethos it would still appear that they have taken some slight inspiration from the original work. And of course, there are the differences that art and literature have made which are only apparent in what we can‘t see: how much easier would it have been to totalitarian state in this country had Orwell and Huxley not written 1984 or Brave New World? I think the crucial point in your question is whether art and literate can still be heard in the clamour of contemporary society, or at least whether they can be heard clearly and free from distortion. The problem, it seems to me, lies in our modern construction of art being simply a category of entertainment. Classified thus, it‘s inevitable that almost all commercially successful art (and these days, if we speak of success, it is generally in a commercial sense) will be managed by an entertainment industry. The clue here is in the word "industry", in that such an enterprise will always place commercial considerations first and will in time condition the people hoping to work in such a field to do the same. What is the point, after all, of creating something exquisite and perfectly expressive of one‘s inmost feelings if there is no way of displaying one‘s creation to an audience of any kind? I see this attitude as being profoundly toxic, and deplore its apparent easy acceptance throughout today‘s supposedly creative community. In my own Blake, Bunyan and John Clare informed opinion, if you are lucky enough to have acquired artistic abilities then expressing them lucidly and eloquently without compromise is not your career, it is your job and your responsibility. If you are an artist, of whatever variety, I suggest that you are more likely to find satisfaction and meaning in your life by remaining loyal to yourself and to the integrity of your creation, rather than by pimping your muse to the first wealthy-looking customer to stroll along the boulevard. Art and literature can make an enormous difference, but only if they are genuinely art and literature as opposed to corporate-approved fanfares that only add to the already deafening level of cultural noise. The complete interview is downloadable from Issuu.com (here). WHEN Lee Burrows first started out in training as an artist he knew a lot about steel erecting and welding...but hadn’t the foggiest idea who Picasso was. Luckily for the art world, Lee’s lecturers were more impressed with his artwork than his early ignorance of famous artists and now, many years later, he is one of the county’s best known talents. The steel factory F W T Burrows & Co, started by Lee’s grandfather, is still running at the Althorp estate today and it was here that the artist – who lives in Harlestone – started out, learning skills in metalwork. Nowadays Lee’s brother Gary runs the firm and the pair have recently teamed up to start producing a new line in welded steel sculptures for the garden or home. Today and tomorrow, between 10am and 5pm, some of these sculptures will form part of Lee’s 7th annual exhibition at the Institute in Upper Harlestone, an event which will also showcase his Northamptonshire landscape paintings.Lee said: “When I was young, mum and dad lived in a farm house and there were fields way back to Welford about four miles away. I was always out and about in the countryside and that made me want to paint landscapes in later life. I never had the desire to be an artist.“I got into steel erecting and welding and it meant I could travel a lot with my brother. Then in Thailand a couple saw me sketching and said ‘you should go to art college.’ I applied but did not even know who Picasso was, I just got in on my sketch book. I did a foundation in Kettering and three years at Cheltenham. Then I got a job in London delivering art.”When he moved back to Northamptonshire he started painting for a living and Neil Duiguid of Primrose Gallery in Northampton offered to sell some of Lee’s landscapes. They sold well and Lee continued. He recalled: “My wife said, ‘you are miserable when you are not painting,’ so I went full time. Northamptonshire is really a county full of beautiful landscapes, people don’t realise just how beautiful it is.”Both Lee and Gary now hope people will appreciate the new creations they are making in steel.Gary said: “We travel extensively together and we saw different things, like some posh offices in Vancouver where they had all of this metal work. We thought we have to do this. There is nothing we can’t make or do.”This weekend’s exhibition will be held to raise money for the Red Cross, as well as a charity close to the family’s heart Autism Concern. Lee and his wife Rebecca have three children, one of whom is autistic, and they know first-hand how important the charity’s work is. During the last decade they have raised about £10,000 for this organisation alone.Rebecca said: “This is our annual show and every year we support Autism Concern. When our son was first diagnosed we were told he was autistic and you have to find out the rest yourself. We did not know what this autism thing was. I used to run a support group which has now been taken over by Autism Concern. We just wanted to raise funds and awareness as well.”Lee, who regularly carries out painting workshops with homeless people at Northampton’s Hope Centre, is also known for his “social” artwork, illustrating issues such as prostitution and homelessness. Between 30 June and August 11, some of Lee’s socially themed artwork will go on display alongside pieces by artist Rita Tomalin. The pair recently won the gallery’s public vote in the Open 11 competition. Northampton Borough Council cabinet member for community engagement Councillor Paul Varnsverry said: "I recall the day the Pride of Northampton's first lion, created by local artist Lee Burrows, prowled out into the town, I knew that this had the potential to seize the hearts and the imagination of the people of Northampton. A pride of lions is due to invade Northampton town centre as part of a new art project for the town. The first of the five foot high sculptures has been delivered to artist Lee Burrows, who has already begun decorating the lion following the theme of the Rose of the Shires. Several of the sculptures will eventually appear around Northampton after specialist art company Wild in Art and the borough council met to discuss hosting the artworks, which have already proved extremely popular in cities including Liverpool and Norwich. Mr Burrows, from Harlestone, has already put a coat of primer on the plain white sculpture with the help of his five-year-old son Ben, and now has just over a week to complete his intricate design. He said: "I think this is a great idea. "The sculptures are really tactile and people love touching them and sitting on them, so I think it will engage the public and get them thinking about art. "I'm working on a design which follows the theme of Rose of the Shires, but I don't want to give too much away about what it will end up looking like. "It's great to know my work will be put in a place where loads of people are going to see it." Mr Burrows, aged 41, was approached by the council after initially speaking to the authority's arts officer about putting artwork into empty shops in the town.He added: "I'm really pleased to have been asked to do the first lion, because it's great exposure for me and the lions will hopefully be really popular with people in Northampton. "Mr Burrows' finished sculpture will be unveiled at a launch event in the town on Tuesday, September 15. 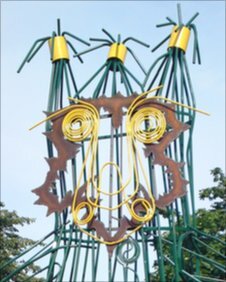 A sculpture, made by local residents in the form of a 'Green Man,' has been unveiled in Northampton. The steel structure was created during a four month steel and metal fabrication workshop hosted at The Old Station Yard in Althorp. It is hoped that the sculpture will act as a nest to attract local birds in the area. The sculpture is located near St James Retail Park on land adjacent to the railway line and Victoria Park. The Green Man is made out of recycled steel and stands 13.5 ft high. It will eventually be covered in Ivy and honeysuckle to attract wrens and cover the steel. Lucy Lisowiec is a local community art consultant and has coordinated the project. She said: "I'm really proud of what the residents have achieved. It looks fantastic and I hope the rest of the community will enjoy him." The work shops were led by Lee Burrows and additionally Roger Burrows who offered his workspace to local residents to learn new skills. Residents gained experience in welding, steel fabrication and design. Lucy Lisowiec hopes the Green Man will bring the community together. She said: "He will act as an educational resource, we can share footage of nesting in local schools and also inspire local residents."